Compact Tone Press in mint turquoise. In research and development, Barber studied the problems associated with classic guitar compressors and their recent clones and found that, while the clone-makers build pedals with improved components (cleaner switching, in particular) and matched transistors, a few of the major drawbacks of those “vintage” designs still exist. The most glaring drawback of popular classic compressors is that they reverse the guitar’s phase and cause a “pop” that squashes the attack at the beginning of every note. Although we now see some compression units that have attack controls, they leave a bit to be desired as they require seemingly endless trial and error tweaking , and still no true solution to gracefully removing the artificial pop when striking the strings. Parallel compression is the solution. a Barber innovation that is more natural than dealing with attack, ratio and release knobs. Barber developed a unique continuous “blend control” circuit, and combined it with a discrete “Class A” FET mixer circuit to allow you to continuously blend the natural signal of your guitar with a “phase-corrected” classic compression circuit. The result? What guitar players have always wanted, unaltered attack with supernatural sustain and resonance. No studio engineering degree required. Our blend control can give from 100% dry, to 100% compression mix, so you are not limited to only "50/50" (half blend). Some of the best parallel compression sounds are achieved with very high sustain settings and more than 50% dry-blend. There's little point to a parallel compressor than can only take you half way there! There are 2 additional toggles one for "speed", which adds a new "fast" mode which is perfect for percussive playing without loss of attack. There is also a "Brilliance" toggle which adds a very subtle and polished sheen to the treble frequencies. 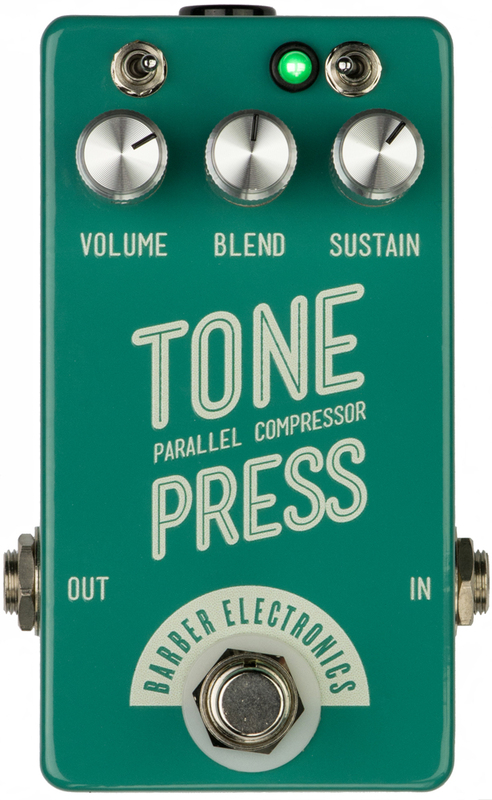 Check out Bryan Ewald's Demo of the Tone Press!